Get the real story here. 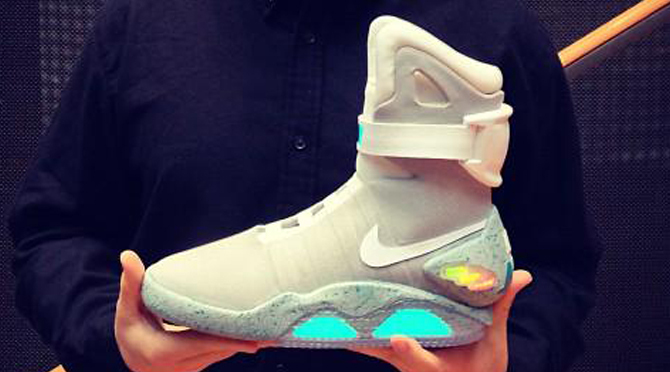 No, this isn't the 2015 Nike MAG release satisfying the prophecy from Back to the Future II. The image, which originates from the tweet below, has picked up steam on the Internet anyway, as some read the accompanying caption as a promise of a Nike MAG release date. The source, Max Erdenberger, formerly worked as an art director at Wieden+Kennedy, the ad agency behind many legendary Nike campaigns, which caused some outlets to speculate that he had inside info on the upcoming release. Sole Collector reached out to Erdenberger, who confirmed that this is the 2011 version of the shoe and not the upcoming pair. Erdenberger also said that he has "nothing to report" on a possible Oct. 21 release date for the shoe. He said he got the idea of posting the shoes while watching today's Apple Keynote 2015 event and wondering to himself what else was going to happen for the remainder of the year. The date mentioned is the same date in the future that Marty McFly arrives on in Back to the Future II, so it's possible the shoes will release then after all. Don't be surprised if Nike does decide to launch the shoes then but, for now, nothing is confirmed.